This widefield image shows an 11 x 7 degree section of Cepheus containing several beautiful nebulae. At the lower left is IC 1396, part of a large molecular cloud known as the Cepheus Bubble. Within IC1396 is IC 1396A - the Elephant Trunk Nebula (on the right side of the nebula in this image). The bright yellow star at the top of the nebula is the yellow supergiant, Mu Cephei. It is believed to be one of the intrinsically brightest stars in our galaxy. 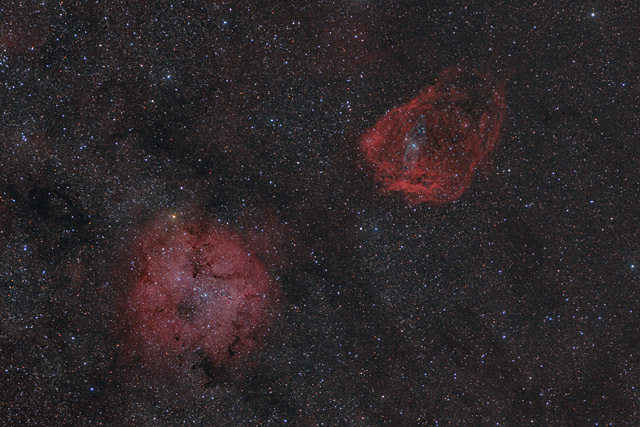 In the upper right of the image is Sh2-129, the Flying Bat Nebula. An HII region similar to IC 1396, Sh2-129 is quite a bit fainter than its neighbor. Superimposed on the Flying Bat Nebula is the enigmatic object OU4, the Squid Nebula. Discovered in 2011, astronomers are still not sure what type of object this very faint nebula may be. This image is a composite of several sets of data. The main image is an RGB (color) image using 2 hours of data captured with a 90mm lens. I then combined this image with 5 2/3 hours of Ha data captured with a 50mm lens. Next, I layered in 22 hours of an HaRGB image of IC 1396 captured with a 200mm lens and then blended in an HaOIIIRGB image of Sh2-129/OU4 containing 45 hours of data captured with the same 200mm lens. As such, this image represents a total of 75 hours of imaging over the course of 12 nights. In this image, North is Up. The image was cropped to 74% of the original size. Software Used Images Plus 5.75 for camera control, calibration, stacking, and digital development, feature mask, star masking, smoothing and noise reduction, and star shrinking. Photoshop CS5 used for levels and curves, hue/saturation colorizing, hue adjustments, lab color, vibrance, match color, selective color, high pass filter, and unsharp mask. Gradient Xterminator for gradient removal. Registar for registration and stack alignment. Carboni Tools for additional noise reduction and smoothing. Focus Magic for focus restoration. HLVG for additional color adjustment. Notes This was the first time I tried using my old Vivitar 90mm lens. The lens was pretty good, but was a little soft in the corners. This image was quite interesting to process, as it involved combining so many different sets of data. I necessarily brightened up the Flying Bat and Squid Nebula to have them show well. Accordingly, the image lacks some sense of reality since this nebula is so much fainter than IC 1396. However, I think the image shows the field of view rather well,and I'm pretty pleased with the final result. This image won first place in Astrophotogallery.org's Medium-Nebula category for February 2014.